On our internal network, we use a self-signed CA certificate. This has worked fine for years, in both Safari and our iOS product, all the way through iOS 10. We simply install the CA certificate on any new device or simulator and everything works, even with ATS. This allows access to all of our internal test servers without having to trust each server individually. NSLocalizedDescription=An SSL error has occurred and a secure connection to the server cannot be made. NSLocalizedRecoverySuggestion=Would you like to connect to the server anyway? I spent considerable time trying to resolve this issue, scouring StackOverflow and the rest of the web. 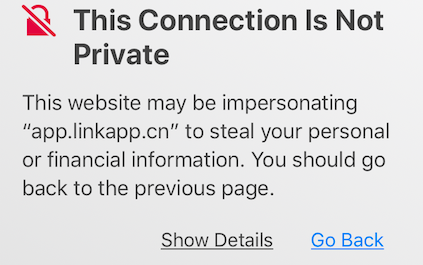 Although we use AFNetworking in our app, that seems to be irrelevant, as Safari no longer trusts these servers via the CA. Disabling ATS via NSAllowsArbitraryLoads allows access to the servers, but obviously isn't a solution. No changes have been made to our -URLSession:didReceiveChallenge:completionHandler code, and we have a proper (worked for years) implementation of challenge response via challenge.protectionSpace.serverTrust. I have re-evaluated and tested both the CA and server certificates every way I can think of, and they work everywhere except iOS 11. What might have changed in ATS for iOS 11 that could cause this issue? While writing this question, I discovered the answer. Installing a CA from Safari no longer automatically trusts it. I had to manually trust it from the Certificate Trust Settings panel (also mentioned in this question). I debated canceling the question, but I thought it might be helpful to have some of the relevant code and log details someone might be looking for. Also, I never encountered the issue until iOS 11. I even went back and reconfirmed that it automatically works up through iOS 10. I've never needed to touch that settings panel before, because any installed certificates were automatically trusted. Maybe it will change by the time iOS 11 ships, but I doubt it. Hopefully this helps save someone the time I wasted. If anyone knows why this behaves differently for some people on different versions of iOS, I'd love to know in comments. Update: Checking out the first iOS 12 beta, it looks like things remain the same. This question/answer/comments are still relevant on iOS 12. Recommended solution is to install and trust a self-signed certificate (root). Assuming you created your own CA and the hierarchy of the certificated is correct you don't need to change the server trust evaluation. This is recommended because it doesn't require any changes in the code. Generate CA and the certificates (you can use openssl: Generating CA and self-signed certificates. When the certificated is installed, go to Certificate Trust Settings (Settings > General > About > Certificate Trust Settings) as in MattP answer. If it is not possible then you need to change server trust evaluation. This has happened to me also, after undating to IOS11 on my iPhone. When I try to connect to the corporate network it bring up the corporate cert and says it isn't trusted. I press the 'trust' button and the connection fails and the cert does not appear in the trusted certs list. If you are not seeing the certificate under General->About->Certificate Trust Settings, then you probably do not have the ROOT CA installed. Very important -- needs to be a ROOT CA, not an intermediary CA. how to access quickblox content swift2?